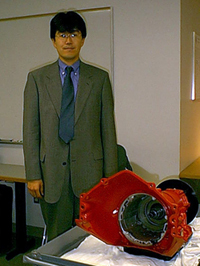 Former Honda Visiting Scientist Mr. Naritomo Higuchi, an automotive engineer from Honda R&D Japan, was a speaker at the SAE Hybrid Vehicle Technologies Symposium, Feb. 9-10. Mr. Higuchi spoke about the Honda Accord Hybrid. He was a visiting scientist with ISR from 1999-2000.